Whenever you leave a place, you take something of it with you. A half-dozen years ago I left South Dakota with indelible memories of chasing pheasants and grouse across seemingly endless prairie. Those memories continually pulled at me until recently I visited the state’s Cheyenne Ridge Signature Lodge with hopes of enjoying another great experience. Those familiar with the lodge know that the ranching family who owns it—the Weinreises—also own North Platte Outpost, a duck hunting lodge in Nebraska. Unsurprisingly, the family’s story is one of endeavor, endurance and accomplishment. The family homesteaded in North Dakota during the early 20th Century, when hunting was undertaken for the table rather than sport. Not to suggest, of course, that hunters didn’t enjoy their labors. Through careful guidance and planning, Chuck and his brothers formed a formidable team. “Our parents would give us chores to do,” he said, “but they were always tasks that couldn’t be completed alone. So we had to learn to work together to get anything done.” This teamwork extended to the hunting field, where the Weinreis boys chased sage grouse, sharptails and prairie chickens. “Sage grouse were probably my favorite,” he said. “My mother used to make the best sage grouse biscuits and gravy.” Interestingly, pheasants were rather scarce in North Dakota at the time and rarely featured on the Weinreis table. Cheyenne Ridge Signature Lodge is perched high on a bluff overlooking Lake Oahe. Its well-managed habitat, quality birds, excellent staff, and first-rate accommodations and food make it a destination that is returned to time and again. In addition to being skilled wingshots, the Weinreis brothers were adept big-game hunters. “Virtually all the meat we ate growing up was game of one kind or another,” Chuck said. Over time the Weinreises’ ranching operations grew, and the brothers decided to diversify. Commercial hunting was an obvious choice, as they already had a strong understanding of land management. This was especially true of habitat creation, and they planted numerous shelterbelts, cultivated native grasses and placed large areas of land into the Conservation Reservation Program. 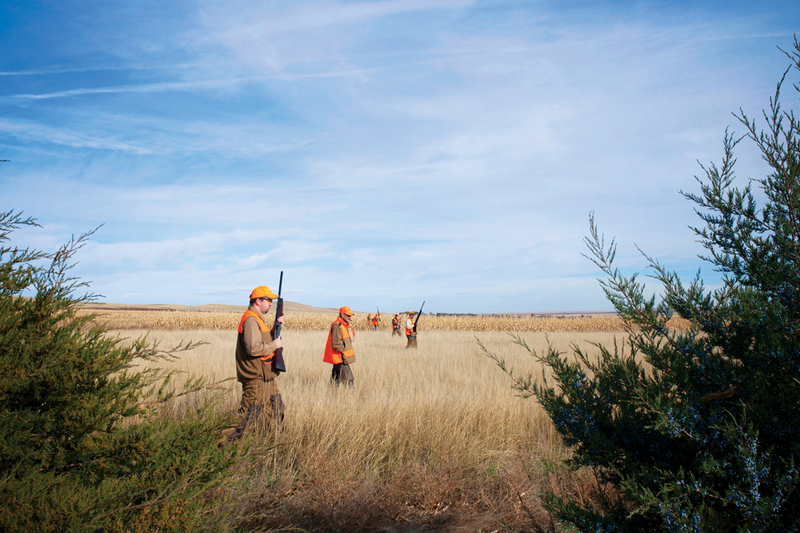 Originally, the brothers owned land exclusively in North Dakota, but they expanded into Nebraska, where they developed North Platte Outpost, and then to South Dakota, where they began pheasant hunting at Signature Lodge. Today the High Adventure Company manages both hunting operations under the Cheyenne Ridge banner. Upon arriving at the recently rebuilt Pierre Regional Airport, I was given a warm welcome by a member of the lodge staff, who transported me 30 minutes to our destination. As we drew close to the lodge, I was reminded of its dramatic setting: perched high on a bluff. Cheyenne Ridge Signature Lodge, which takes its name from the Native American people who once wandered these plains, enjoys spectacular views of magnificent Lake Oahe. 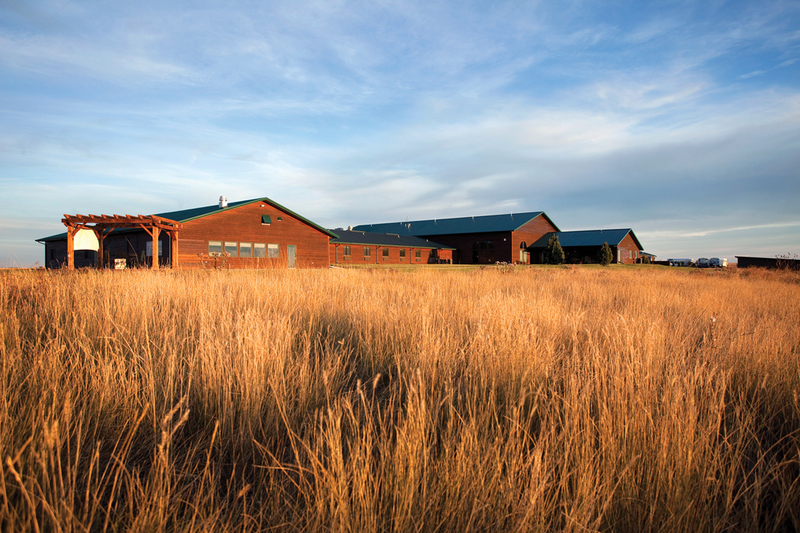 Signature Lodge was developed for pheasant hunters in 1994, and then remodeled by the Weinreis family in the 2000s to provide 28 single-occupancy bedrooms and five suites, all with private baths. Along with amenities experienced at other high-end lodges, Signature Lodge offers a unique cognac and cigar lounge complete with an ice bar, a fitness center with a sauna and hot tub, a business center and an enclosed 5 Stand clay-pigeon setup. 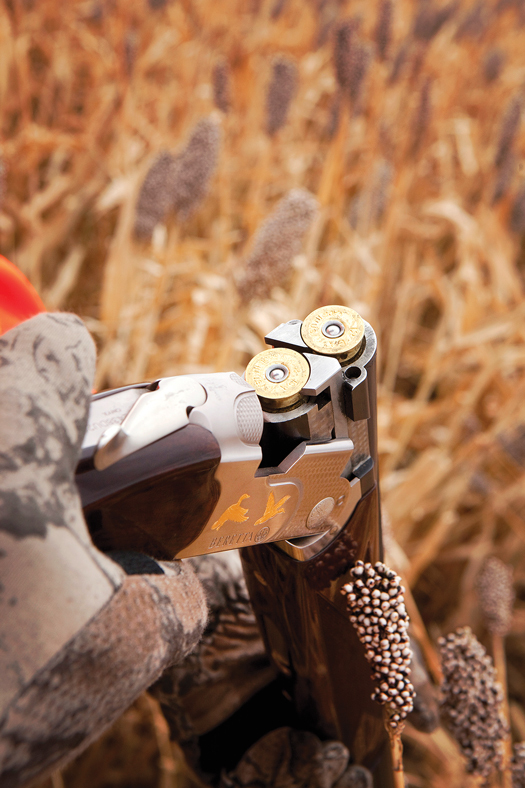 In addition Signature Lodge is one of only six lodges in the world to have been awarded two Beretta Tridents for excellence in upland hunting. The lodge is run by General Manager and Executive Chef Sean Finley. Sean is a graduate of Clemson University and has a bachelor’s degree in Aquaculture, Wildlife and Fisheries Management. He also holds a masters degree in Hospitality Management from Texas Tech University. Together with impressive academic credentials, Sean has many years of experience within the hunting hospitality industry, several of which he has spent at Signature Lodge. 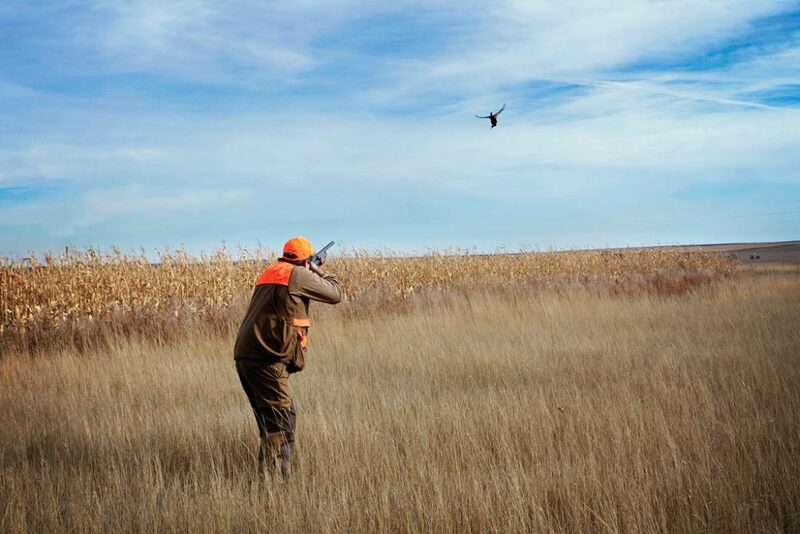 South Dakota was actually the second leg of a wingshooting journey that had begun for me in the high plains of Montana. My first stop—more an annual pilgrimage—had involved hunting Hungarian partridge with a great friend and upland hunting mentor. So when I arrived in South Dakota, I already had enjoyed somewhat of a warm-up. Still I decided to take advantage of the lodge’s covered 5 Stand range, where I was joined by Sean and two of his Texas Tech hospitality-management interns. The setup showed a fine mix of targets, and a good-natured competition ensued. And although no one shot a clear round, all of us had tremendous fun trying. The next morning hope ran high as we departed the lodge. The rest of my team had arrived late the previous evening and looked bleary eyed as we rode the converted school bus to the first field. We were an eclectic mix of six friends and industry acquaintances from as far away as Georgia, Mississippi and Massachusetts. 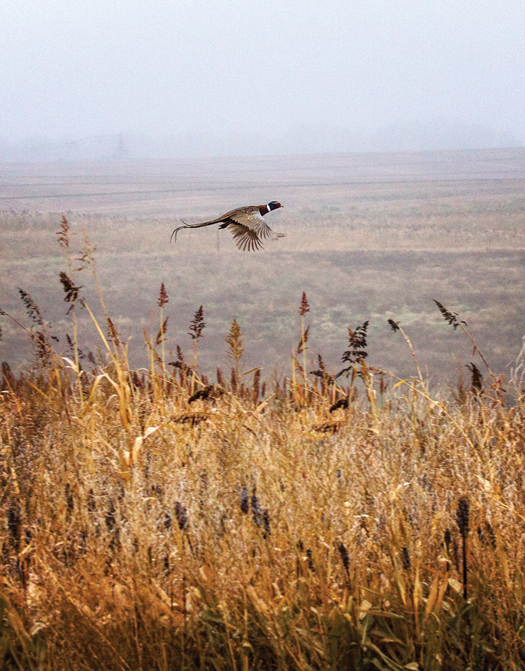 For some, Dakota pheasant hunting was a fixture on their annual wingshooting calendar. For others this was their maiden pheasant experience. Leading our hunt was guide Greg Goodman, a South Dakota native. Joining him was J Cline, a former Signature Lodge guide and close friend of our group. J had received a hall pass from his sympathetic wife and taken time away from his music label and barbecue-sauce business in Nashville to work his dogs and reconnect with old buddies. 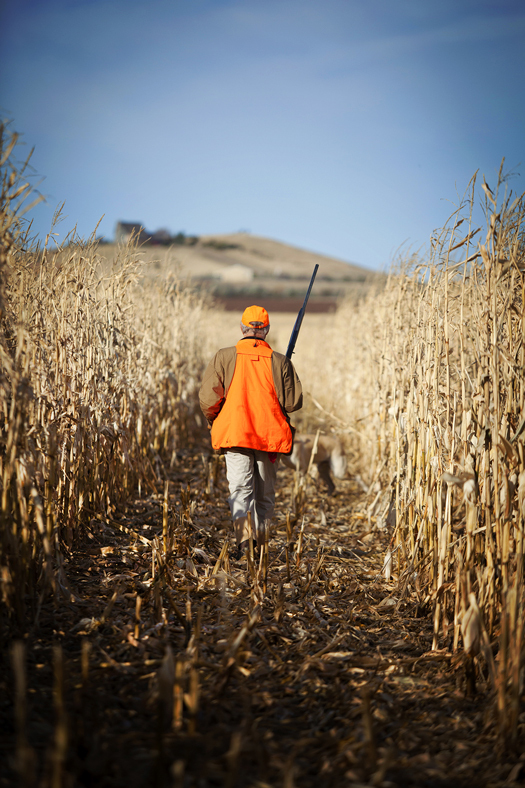 The morning hunt took place in a large field where natural grasses framed manicured strips of milo, sunflowers and corn. Greg suggested we split the team, with two hunters walking alongside the guides and two flanking on the outside of the cover. The remaining two would take up positions at the end of the cover strip to act as blockers. “OK, load up,” Greg said. And we were off. As most hunters appreciate, bird finding comes before bird shooting, so our attention turned to our canine companions: a pair of handsome Labs that Greg had put on the ground along with J’s excellent Boykin spaniels. The dogs rushed enthusiastically into the cover strip, and almost immediately a flicker of auburn feathers and familiar cackle signaled the first rooster of the day. I looked up in time to witness the perfect silhouette of flush, flight and shot, as my neighbor harvested the bird. One of Greg’s Labs marked down the rooster and made a flawless retrieve. We swapped positions and began walking through the next cover strip. Now acting as a flanker high on the left side of the line, I had a grand view as a growing number of roosters began flying forward. Several birds fell to the guns of my neighbors as well as the blockers ahead. Then it was my turn as a rooster ran to the edge of the cover before rising and banking to my left. I rushed my first shot, missing cleanly, but stretched out and connected on the long crosser. As the pheasant folded and landed in the adjacent cover strip, I smiled and thought how every hunter gets lucky and bags a “stadium bird” once a season. That was mine! There was something tremendously comforting about having friends to miss with. As we continued through the cover, more roosters rose and, more often than not, fell. 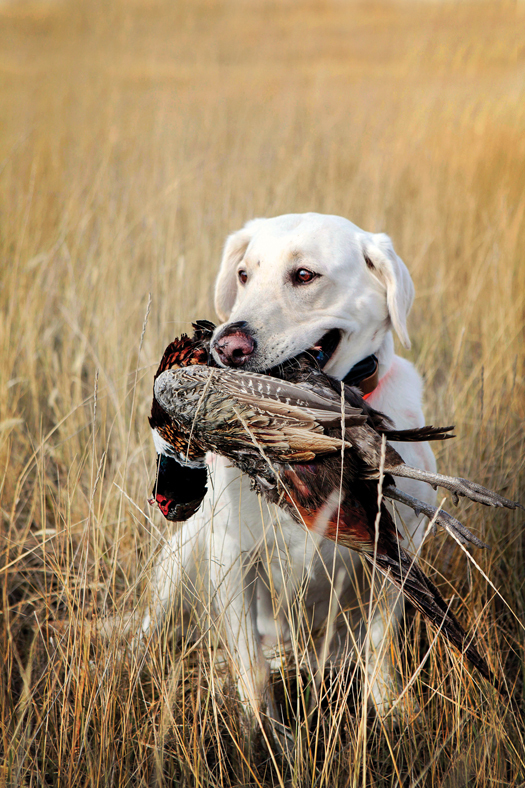 Greg and J called “Rooster!” or “Hen!” with each rising bird, enabling us to focus on rewarding the dogs with retrieves. After driving several cover strips, tired feet signaled that it was time for lunch. So we returned to the lodge to regroup and satisfy our stomachs. Sean’s delicious white-bean-and-pheasant chili was as welcome as the nap that followed. Later that afternoon we hunted an area where well-established shelterbelts complemented dense corn and milo strips. The weather held, and conditions were bone dry. While the parched land made for easy walking, the rattling of dry corn delivered a natural warning to the birds. Still, the dogs worked purposefully and missed little. Certainly dry and warm hands coupled with good footing more than compensated for the roosters that rose out of range. That evening at the lodge we reflected on our experience—a day filled with excellent dogwork, challenging birds and, most important, quality time with good friends. As we watched the sun set over Lake Oahe, we all agreed that there was little that could have been improved. At dinner Sean introduced us to a menu item straight from the rancher’s playbook: a 40-ounce bone-in rib eye. The steak was prepared without pretense and served with hand-cut fries, onion rings and a fabulous béarnaise sauce. One certainty of a visit to Signature Lodge is that you won’t lose weight—no matter how far you walk. The next morning I woke from a calorie-induced slumber and saw that the forecast had proven right. Ominous-looking clouds had arrived, and with them wind and a significant temperature drop. The rain that followed muffled our field noise but didn’t dampen our spirits. Perhaps it was the super-size steak or more likely the fine wine that accompanied it, but we started in rather mediocre shooting form. In fact, after the first couple of cover strips our guides were questioning whether they had collected the wrong team at the lodge. Still, there was something tremendously comforting about having friends to miss with. Thankfully, after some less-than-gentle leg pulling, our performance began to improve. And with the birds sitting tighter, the walking Guns tended to enjoy more shooting. Markedly fewer roosters ran, and the large flushes that typified our first day became less pronounced. As our time in the field drew to a close, it struck me that although everyone who hunts with Cheyenne Ridge enjoys harvesting gamebirds, that singular act makes up but a small fraction of the enjoyment derived from each day. It’s friendship in the field, stylish dogwork and quality habitat that draw hunters back to Signature Lodge year after year.